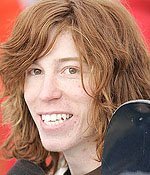 DECEMBER 19--Shaun White, the popular snowboarder known as 'The Flying Tomato,' is facing a misdemeanor criminal rap for allegedly setting off a fire extinguisher at a Colorado ski resort. The 21-year-old White, who won a gold medal at the 2006 Olympics, was nabbed in connection with an incident last Friday in a game room at the Beaver Run ski resort. White, who had been in the game room with a woman he was playfully chasing with a pool stick, was charged after cops matched his distinctive shoes with those seen on the surveillance video. Investigators also noted that the 'tread pattern' on White's kicks matched footprints left in the dust caused by the fire extinguisher discharge. After the incident, a hotel security guard approached the couple, since he had seen them entering the game room prior to the extinguisher being discharged. The guard, Sean Fay, asked if the duo had seen anyone exiting the game room. 'The male told Fay he observed a white male with long red hair pulling the pin from the fire extinguisher.' Bizarrely, it seems that White actually fingered himself.